I decided to contact you after reading your profile, because of the urgency of my situation here, My name is Alice Richard Nsengiyaremye, 28 years old girl from Rwanda, German East Africa, my father was deceased, Dr. Richard Nsengiyaremye, was a Rwandan politician and the Prime Minister of Rwanda Government. He was killed together with the wife at the beginning of the Rwandan Genocide at April 1994..I do not know how far you are with events and fragile political situation in Rwanda at this time. In fact, I am compelled to contact you because of the abuse I m receiving from my step mother, My father had two wives before his death, My mother was was the second, the first one does not raise him an issue after nine years of their marriage, he had the idea of a second wife that happened to my late mother, After her marriage to my mother, the first woman turned hostile and aggressive, to the extent that my father had sent to her packing and rented an apartment for them in the city, She came back with her things after the news of the death of my parents has become more and no less hostile to me and want to claim all of my father's assets. since then my life has been in tears,but In the meantime, I wanted to escape to Europe but unfortunately My Step Mother hide my international passport, she wants to kill me. So I ran to the Streets of Hope Charity in Senegal seeking asylum under the United Nations High Commissioner here in Dakar, decided to choose the Streets of Hope Charity in Republic of Senegal, because of my inability and lack of resources, I am with you for a help contact Please, I would be delighted if you should consider me for help please. I am contacting you for a long term business and investment in your country. it happens that From my father's file i discovered that My father of blessed memory deposited the sum of U.S. $2.700, 000 .. 00 in a bank in London with my name as the next of kin, When I got the news-about the money deposited in London, I went to the bank where my father deposited the fund, so I can withdraw some money as the next of kin to the account and start a new life. Unfortunately I did not know that my father was into an agreement with the bank that the money will not be released directly to me, if not married or signed up to 30 years. The agreement states that I am a trustee / investor at any time I want the money from the bank, I understood that for the investors to invest and manage the money for me is good business, I was looking for someone to represent me for claims in accordance with their agreement with my late father, this is why I contacted you. Secondly, I wish to continue with my education in your country if things work out as planned because i was in college when the crisis started together with the death of my parents, It is my intention to compensate you with 20% of the total money for your services and the balance shall be my investment capital. This is the reason I decided to contact you, As soon as I receive your positive response showing your interest I will put things into action immediately. In light of the above I would appreciate an urgent message indicating your ability and willingness to handle this transaction sincerely, You can not call me on the phone because I have no phone, but here if you like to speak to me on the phone, I will give you the telephone number of the Reverend father here in the Streets of Hope Charity Home, because I told him a little about my condition.Here is the number +221773955482 When you call, tell him you want to speak to Miss Alice Richard ,Rwanda girl, hostel no 13 room 6, he will definitely send for me. Awaiting your urgent and positive response.Am pleading that you protect this secret between us till i become free from all these. How are you today? and thanks for your mail however the procedure is that you have to contact the transferring bank in London to initiate the transfer, Life is very difficult for me here in the camp, my prayers is that almighty God will be with us through out this transaction, In fact, I have believed without doubt that you are God sent to help me, I have therefore decided to reveal to you in good faith every details about me and this proposal. You have nothing much to do for this transfer to become a success, all that is required from you is a safe bank account where the money will be transferred into. I shall forward to you in due course all the necessary, legal and authentic documents of the fund. You have no atom of risk to bear in this transaction. When I received your mail saying that you agree to help me, I communicated to the holding bank to inform them that I have got someone who has agreed to be my TRUSTEE/PARTNER, trustee/representative for the claim and investment/management of the money. The bank people said you should contact them directly for confirmation if it is true before they can begin to process the transfer as you will instruct them.The manager said that if it is true, then they will tell you the process to release the money to you as my trustee and investor in line with United Kingdom and your country's financial laws. The manager said that as soon as they receive your application letter they will let you know the transferring procedure's. You should please write to the bank and confirm to them that I appointed you and they should tell you the process to transfer the money to your bank account. I will be happy if you do this transfer quickly because I don't like this country.I want to leave.The name of the bank as I told you is The Royal Bank of Scotland Plc,London.The name of the staff who is in charge. But, one of the staff in the bank helped me to draft the type of application you should send to the bank requesting for the transfer of the money into your own bank account.So send the below letter to the bank email address so that they will start the release of the money. So send the application to the bank to initiate the claim. Take care of yourself and lots of love and kisses. APPLICATION FOR CLOSURE OF BANK ACCOUNT NO:000641710916 SWIFT CODE: CMDS07, DEPOSIT CODE: EWVI006.SECURITY CODE: 61/2001/SEC09. Beneficiary Alice Richard Nsengiyaremye, BELONGING TO LATE Dr. Richard Nsengiyaremye AND TRANSFER OF THE US$2,700,000..00 (TWO MILLION SEVEN HUNDRED THOUSAND US DOLLARS ONLY) THEREIN INTO MY OWN BANK ACCOUNT. This application is necessitated by my appointment as the trustee, investor and manager of Miss Alice Richard Nsengiyaremye, who is the next of kin to the account bearer entitled to inherit her late father's deposit, Please let me know the procedures and requirements for transfer of this money to my bank account without violating financial laws of London and my country. I shall provide any document required by your bank to prove my claim. Subject: Re: RE: Fwd: REFF: A/c number 000641710916. I have been directed by the director of Foreign Operation/ Wire Transfer to write you in respect to your mail and your partner's mail which we received in Escrow Bank. Actually, we have earlier been informed about you by the young lady Miss Alice Richard Nsengiyaremye (the next of kin) that she wishes you to be her trustee/represent for the claim of her late father's deposit with this bank. Late (Dr. Richard Nsengiyaremye) is our late customer with sum substantial amount of money he deposit with us,$2.7M Dollars. (Two Million Seven Hundred Thousand Dollars) hence you have been really appointed as a trustee to represent the next of Kin. How ever before our bank will transact any business concerning the transfer of the fund to your bank,we will like you to send the followings immediately to our bank. 2.The death certificate of (Her deceased father) confirming his death. 3.A Certificate Deposit issued to him by our bank. Should you have any question(s), please contact our Foreign Operational For Immediate- From the Desk of: Mr. Phil Lewis Transfer Manager (RBS). Subject: Please Contact The Lawyer For The Necessary Document! Good day to you and i am very much happy to hear the good development that the holding bank have accepted to release the fund in your nominated bank account thank for your caring and concern towards the release of this my fund.I hope this mail finds you well and healthy.I also hope that your work is going-on fine.Greetings from me here Alice. Another issue of importance, After reading the message you received from the bank I understand that they required a backing documents signed by Senegalese lawyer, 1) Firstly I have the Death Certificate and Deposit Certifate of my late father with me here and I have attachard it to them looking for the rest of the documents are secured try to forward it as the bank requested it from you. 2) Since you can't come here in person I have been thinking that we will need the services of a lawyer here who will represent us to the federal high court to get the affidavit of oath and support, the lawyer will also help us to prepare the power of attorney on our behalf. This lawyer will help us to get the items which is the power of attorney and the affidavit oath and the lawyer will also draft the transfer application for us and support from the federal high court here in Senegal and Honey they is no confiscation about this transaction to your country the same lawyer can help you instruct the bank to transfer the fund bit by bit without much awareness by your government financial authorities. Solicitors and Advocates Principle attorney. Please Dearest , I will like you to make contact with this law firm immediately and ask him to help us to get those needed document for us to enable you send them to the bank for the wire transfer of the money into your account, as you can see that everything concerning this transfer is complete, please help me out to see that this lawyer get this documents within this week OK, my prayers are with you and I know that God will surely see us through. Send the letter you received from the bank to the lawyer for his more understanding. I will never forget you in my life, God bless you for me, waiting to hear from you with the response from the lawyer tomorrow, please call the lawyer on the telephone so that he will know our seriousness OK at the same time send also an email. Send the letter you received from the bank to the lawyer immediately for his more understanding on what he need to do,Thank you for your concern,always put me in your daily prayers. Have a very pleasant day, Sweet Kisses. Is me your Wife to be. REGARDING YOUR REQUEST ON YOUR WIFE/PARTNER'S TRANSFER FUND MISS ALICE HAVE BEEN IN COMMUNICATION US ON YOUR BEHALF ABOUT YOUR REQUESTED BUT WITH HOPE YOU WILL REALLY GET THINGS RIGHT DUE TO HOW THIS MATTER IS SERIOUSLY TO HANDEL AND THE URGENT SO I JUST TO LET YOU KNOW HOW TO PREPARE A POWER OF ATTORNEY AND AFFIDAVIT OF OATH IN YOUR NAME AND YOUR PARTNER MISS ALICE RICHARD NSENGIYAREMYE,I HAVE STAND ON YOUR LEGAL ADVISER TO THIS TRANSFER OF YOUR PARTNER'S FUND FROM THE (RBS) BANK TO YOUR NOMINATED BANK ACCOUNT INTO YOUR COUNTRY ,SINCE YOU CAN'T BE ABLE TO COME DOWN TO SENEGAL DUE TO SOME CIRCUMSTANCE BEYOND YOUR CONTROL. FROM MY FINDINGS WITH THE BANK AS I PROMISED TO YOU, MY LAW FIRM WAS MADE TO UNDERSTAND THAT THERE ARE TWO DOCUMENTS REQUIRED NECESSARY TO ADD YOUR FULL DATA FROM THE SENEGAL HIGH COURT OF JUSTICE BY THE BANK BEFORE THE TRANSFER OF THIS FUND COULD BE COMMENCE INTO YOUR NOMINATED BANK ACCOUNT,WHICH YOU ARE AWARE AS A LEARNED PERSON ABOUT THE (RBS) BANK REQUIREMENTS,MEANWHILE I HAVE ALREADY RECEIVED THE DEPOSIT AND DEATH CERTIFICATES FROM YOUR PARTNER/WIFE MISS ALICE RICHARD NSENGIYAREMYE BEFORE GOING TO THE COURT. IN REGARDS OF THE ABOVE I HAVE NEGOTIATED WITH THE CHIEF JUDGE OF THE FEDERAL HIGH COURT OF JUSTICE. ACTUALLY THE DOCUMENTS WILL COST THE SUM OF ($300 DOLLARS) FOR THE AUTHENTICATION OF THE POWER OF ATTORNEY. ($500) FOR THE SWEARING OF THE AFFIDAVIT OF OATH AT THE FEDERAL HIGH COURT HERE BEFORE IT BECOMES VALID. ($50.00 US ONLY) FOR NOTARY STAMPING AT THE NOTARY OFFICES HERE AS YOU CAN SEE GOVERNMENT DECISION IS UNCHANGEABLE. 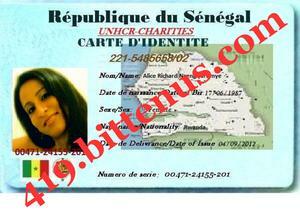 THE TOTAL AMOUNT TO GET THESE DOCUMENTS WILL COST ($850,00) US ONLY, BUT IF YOU PREFER YOU CAN COME DOWN TO SENEGAL, AND UPON SENDING NECESSARY FEE DUE SEND YOUR SCAN COPY OF YOUR ID FOR IDENTIFICATION PURPOSE AS THE NEW BENEFICIARY OF THE SAID AMOUNT OF ($2.7M) US ONLY THROUGH WRITTEN DOWN IN WORDS. Notice, Since the bank have agreed on our request, there is no other things we can do than to get the Documents from the federal high Court and submit them to the Bank, so you have to look forward to pay for your documents fee and all the money am spending on transportation from deference offices here to the high court of justice i have not complain about it until we succeed the transaction. as soon as the fee sent advise your wife/partner Miss Alice Richard to come down to our office for the signing of those mention documents in your favor.remember the copies of the document's will be forwarding to you as we finished it to enable you send them to the bank for confirmation. IF YOU ACCEPTED OUR SERVICES YOU WILL LET ME KNOW IN OTHER FOR THE PAYMENT, MAKE SURE YOU SEND THE CONTROL NUMBER, SO THAT PROCESS OF THE PAPERS WILL START THE PROCESSING OF THE REQUESTED DOCUMENTS WHICH WILL BE READY IN THE NEXT 2 WORKING DAYS. Thank you for choosing our service and we are happy working with you. I am waiting for this information because it necessary for my verification with the bank as well to appear into the mention documents. With Due Respect Sir, we are suprised of your comment concerning sending the fee through western Union money transfer which is save and faster we the chamber have been using it worldwide but bank to bank can delay up to 3 to 4 days here. Note, without wasting much our time on proceeding the papers as we still have other things at hand by focusing the matter at the moment we are advice to send the said fee to this new account to enable us meet up with apointed arrangement with the people in involves as we have discussed already and upon sending the documents fee we still expecting to recieved your attach copy of your ID card / Driving License / Passport copy note: any of the copy can be use. I am waiting for this information because it necessary for idatification with the bank as well to appear into the mention documents.